After battling through the oncoming Rugby crowds swarming to Cardiff Central, I managed to get to The Tramshed on the outskirts of the Western side of the city centre to see the mighty Welsh formed Skindred performing on home turf. It had been three years since they performed here, and I was in attendance to that also, yet it only seems like a couple of months ago. Getting through security quickly I placed myself up on the balcony away from the maddening throng below, all well-oiled in preparation for the nights entertainment and already moving as one to Aaron Buchanon and his band The Cult Classics. Due to the delay, the guys were already in full flow, hammering through their set of Classic Rock. Aaron himself was a prominent member of Heavens Basement, before moving on to his own bands, including this reincarnation featuring drummer Paul White (Defiled/Seasons End). What struck me the most was the music was hard and heavy, and I'm sure that Aaron, with his posture and pose, and his impressive range has been classically trained. He had no issues, hitting the top or the low notes with ease. It wasn't this that stuck out the most, what humoured me, in a good way, was the fact that whilst the other members were all dressed in typical "Rock" outfits, Aaron started off with a rather vibrant and flowery jacket, tight skinny black trousers, and once he whisked off the jacket, a nice clean and crisp white shirt was revealed with trouser braces. His stage presence is one that the crowd could easily interact with, and he used all of the stage to his advantage. The poses were interesting, pulling the classic vocal pose with mic lead in one hand outstretched at hip height, whilst air guitaring with the other, and his legs from the hips down were doing some kind of Michael Flatley 'River Dance' moves. During their set, there was a nice little medley, starting with 'My Sharona', moving to Iron Maiden, then Kiss' 'I Was Made For Loving You' before moving on to a killer drum solo. 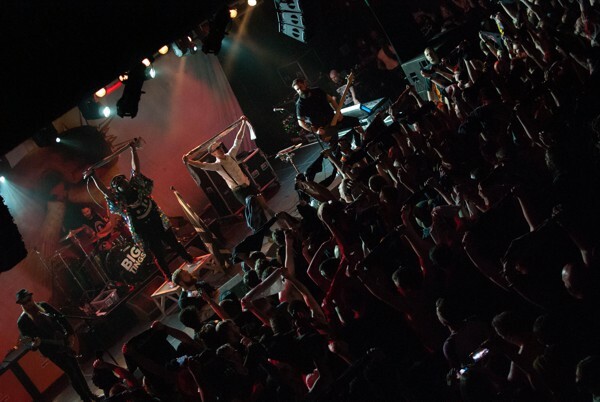 Just before the end, Aaron encouraged the crowd to move forward towards the barrier, and gently stepped to the awaiting risen hands, only to perform a handstand held by the audience before being gently moved towards security and the stage and ending the song and their impressive set. If you are a fan of British Classic Rock, then certainly give these guys and gal a listen. Following a quick break, another band that is breaking the circuit emerged on to the stage to cheers of excitement. Those Damn Crows were, to be fair, a band that I had not heard a lot about, yet, I have now had the pleasure of seeing them twice in November. If you have not had the experience of seeing them, I will introduce them now. They are a Nu-Metal, Hard Rock five-piece band from Bridgend, South Wales. 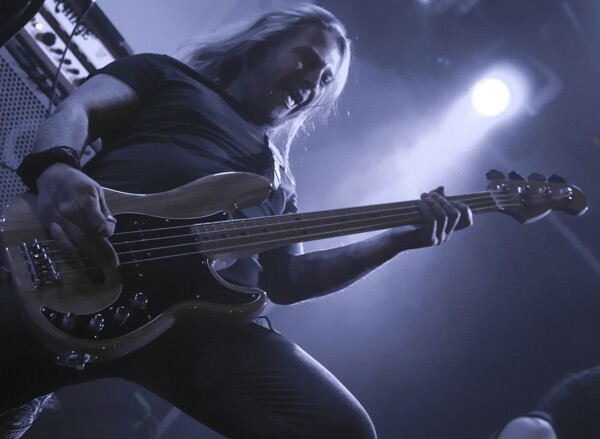 They have performed around the UK and at festivals such as Ramblin' Man, Steelhouse, HRH, Giants Of Rock, Planet Rockstock and are surely staking their place in the scene. 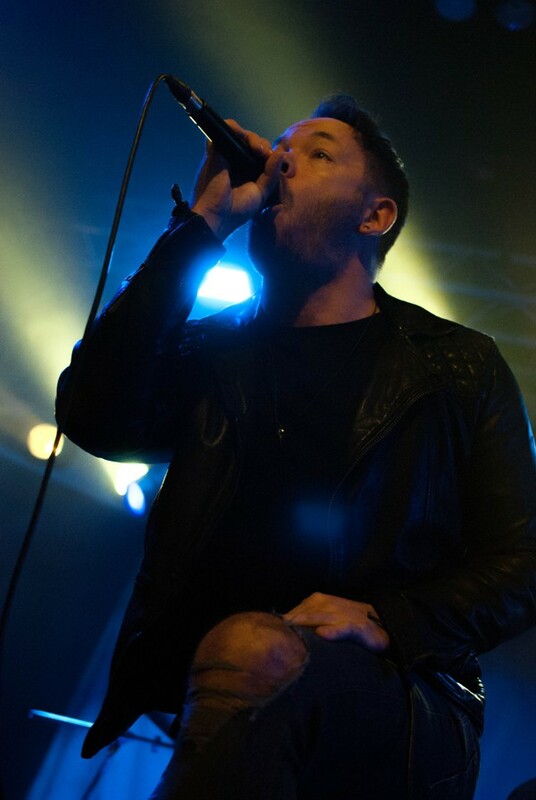 Some may know them from their single 'Fear The Broken' which premiered through Kerrang.com, and their debut album 'Murder And The Motive', and the guys have recently signed a worldwide record deal with Earache Records. Starting their set, vocalist Shane Greenhall entered the stage, joined by crowd favourite, bassist Lloyd Wood who seems to get fans calling out his name, closely followed by drummer Ronnie Huxford and guitarists Ian Thomas and David Winchurch. Their blistering set, comprising mainly of tracks from the aforementioned 'Murder And Motive' was delivered with power and vibrance. The bands sound is a mix of Alter Bridge and Stone Sour, with an added extra je ne sais quoi to make it their own. Aggressive and punchy power riffs, accompanied with Shane's melodic vocals, delivered with charisma, make Those Damn Crows a delight to watch and listen to. Tracks such as 'Don't Give A Damn', with its modern aggressive melodies, to the Punk driven 'Someone Someday', these guys showed they can mix styles confidently. The audience were even treated to a new track entitled 'Devil In My Pocket', which seemed to go down well with the revved up attendees. Ending their set with what I would class as the band's anthem, 'Rock N Roll Ain't Dead' had the room singing their hearts out to the chorus, and they left the stage and the crowd on a high. Skindred have been touring extensively since April, starting in the UK, before moving to Mexico, Sweden and mainland Europe. They returned to British shores again in August, in support of their latest release 'Big Tings'. Coincidently, they are already advertising for their 2019 tour. Do these guys ever stop? Inside the hot and sweaty venue, people were eagerly chanting for Benji and his loyal troupe to hit the stage and it wasn't long before the intro music by John Williams, 'The Imperial March', starts. The lights dimmed and the Master graced the stage, followed by guitarist Mikey Demus, bassist Dan Pugsley and last but not least, drummer Arya Goggin. The crowd went wild, and with no hesitation, Benji boomed straight into the title track 'Big Tings'. I personally find this album to be more melodic with a hint of Nu-Metal, with the core being, of course, their unique and founded Ragga Metal style running through the roots of each track. From the outset, a mosh pit was formed, and unwilling participants were either chucked out to the sides or the ones at the front clung onto the barrier for dear life. If the participants were not moshing, they were jumping, bouncing vigorously, and I'm sure there were a few tremors encountered by the nearest geographical centre with the vibrations being produced by the band and attendees. It was amazing to watch the throng and the crowd interaction by the lead man, it just added that special touch. You could clearly see the honour and respect his fans have for the band as they hung onto every spoken and "Rapped" word. At some points, you could hardly hear Benji as the singing back from the audience was so loud, it was immense. The new tunes still continue with their infectious vibe, and mixed with fan favourites from their back catalogue. 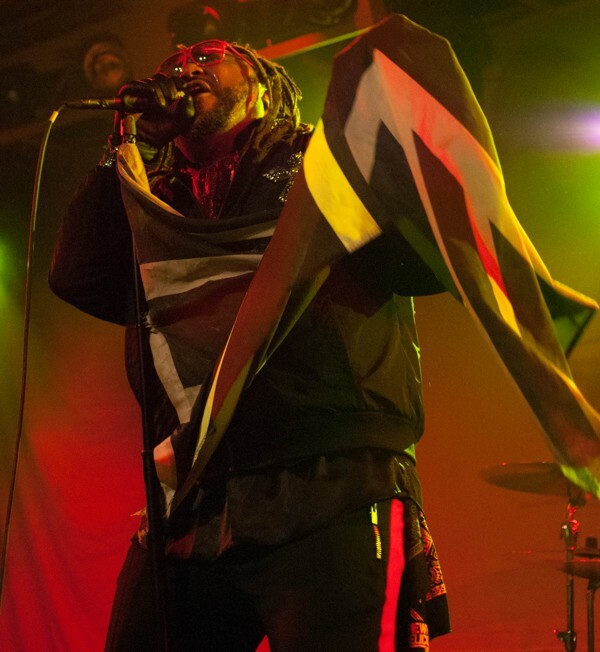 The night was amazing, made truly special to have the band performing in the Welsh capital, and I can assure you, these Welsh supporters hold Skindred close to their hearts, a true Metal icon. Other hits from 'Big Tings' included the single 'That's My Jam', 'Machine' which went down a right corker, and an acoustic version of 'Saying It Now', which Benji, accompanied by guitarist Mickey Demus, emotionally told a little intro story about how he put off visiting a friend and time had passed by and it was all too late. It was great to see the pace slow down and the lead man show off his unique talents, not only as a Ragga star, but also as a true vocalist that can put his heart and soul into such a soft and touching moment, whilst Mickey expertly plucked the acoustic with sincere emotion. A few appearances from their 2002 album 'Babylon' were added to the mix, with 'Selector', favourite pleaser 'Pressure' and 'Nobody'. Moving through the ages, in and out of the band's past discography, 'Rat Race' from their 2007 'Roots Rock Riot', joined the title track 'Kill The Power' and the single 'Ninja', and the only one from 'Volume' (not including the aforementioned 'Saying It Now' which features on both) was 'Sound The Siren'. Arya pummelled down the beats (even though there were a few times he was rubbing his right shoulder), whilst bassist Daniel drove in those funky grooves with precision. In a class of his own, Mickey Demus really topped it off with his solos and riffs. The band are so tight together and look so good as a team, you can tell they not only take their performing seriously but enjoy it a lot. 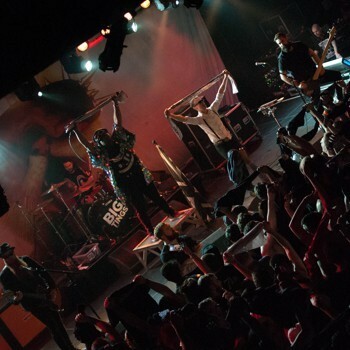 During the set, Benji whipped off his jacket and a tee that he was wearing and goaded the crowd, hands flying everywhere attempting to grab it, before he threw it onto the stage. For those unlucky souls who were most upset that they didn't catch it, he had a "runners up" prize of a "Skindred Sandwich", a supermarket-bought sarnie that had its box autographed by the band. Can't say I have ever seen one of those on the merch stand, but great gimmickry there. Drawing to a close, the band walked off for the encore, to which the roof was metaphorically lifted off by the chanting from the attendees. Bouncing back on in a silver sequinned jacket, the ringmaster teased the onlookers, asking them to raise their shirts in both hands above their head. Aaron Buchanan joined the band on stage, ready with a shirt of his own. Pose was struck. This was done with ease as we all knew what was going to happen next. The song that made famous the 'Newport Helicopter', the track we all know and love as 'Warning'. The place went wild, more bouncing, more moshing and more whirling of tee-shirts, mirrored by the performers onstage and I'm sure there were a few fans that lost theirs in the mash up. With that, the outro of 'Nobody Does It Better' aired over the venues PA, the band took a bow to whistles, whoops and appreciative cheers before they walked off the stage, and we, a very contented and satisfied group went out into the cold fresh Cardiff night air.